If you’ve dreamed of retiring or worry about what you’d do with your business if you were to become incapacitated, consider a small business succession plan. Your business doesn’t have to shut down if you’re not able to work. Without a plan, your family and colleagues could be left with a legal and operational mess that can cost time, money, resources, and potentially the entire business. That’s why you need to think ahead. It could take three to five years to fully implement a succession plan so start planning as soon as you can! Financials: As small business owners we often wear a lot of hats, including being our own accounting department. If you’re not an accountant, bookkeeping and financials can be overlooked but they shouldn’t be. 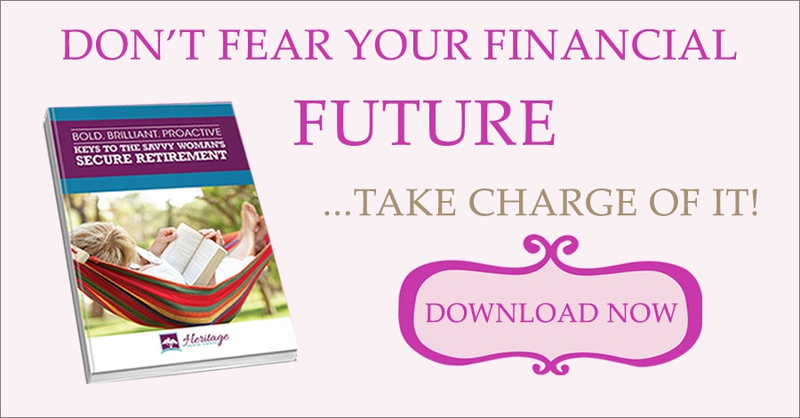 Always have your books up to date so that you don’t have to worry about where your business stands financially whether that’s today or when you’re ready to retire. Login information. If you’re like me, you’ve got logins for everything from banking to social media stored in your head, scratched on random pieces of paper, or saved in a document that no one knows exists. To save yourself, colleagues, and loved ones time later, store all logins in one secure location that your successor and/or loved one knows. Legal advice. Seek legal advice regarding setting up durable powers of attorney for your business. If no one except you has access to the bank account, for example, your employees or vendors may not be able to get paid if you’re not there. Insurance advice. As a business owner, you may need insurance for your business that covers business expenses in the event of your death. This, of course, is in addition to personal life insurance. The most important decision you will need to make in your small business succession plan is who you want to be your successor. Do you want to sell your business? It will need to be organized and evaluated for sale. Do you want to be involved in the training of the new owner? You might work in your business for a period of time even after the sale occurs. Is there someone in your organization who wants to buy the business or who you want to run your business? They will need to be trained. If they want to purchase the business, they will need time to get financing together. If there is more than one partner, you will need a buy/sell agreement that is agreeable to all partners and the buyer. Even if you’re the only owner, it can be a complicated process. Succession planning isn’t simple and it takes a significant period of time. Be prepared before it’s too late. 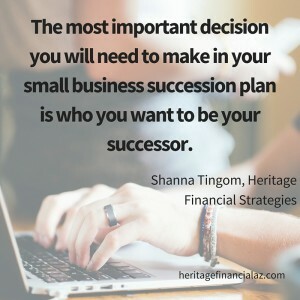 If you’re interested in learning how I help business owners meet financial investment goals, call Heritage Financial Strategies at 480-397-1184 to schedule an appointment today!